There is so much more to designing a round flower bed than just making a circle and planting some seeds. Every aspect of the project must be examined before turning over one shovel of dirt. From lighting requirements to slope for proper drainage, a beautiful flower bed starts with a good plan. Walk the proposed area for the round flower bed. Observe the amount of sunlight the area receives each day. Check the slope of the ground to determine where there could be standing water or where the water will drain. Locate any problem areas, such as shade from a building, fence or tree. Take a picture of the area, if you wish, to study the garden site as you plan. Take and test a soil sample of the location. 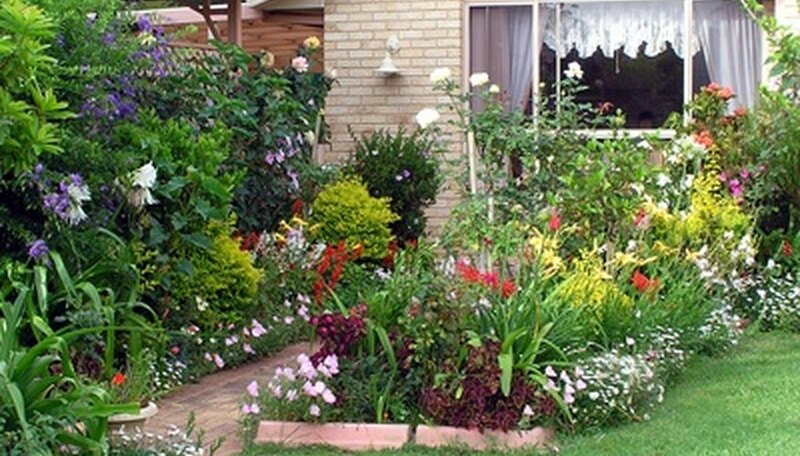 Choose the types of plants you want to grow in the round flower bed. Ask yourself questions about maintenance and plant care. If the flower bed is large, tall plants in the middle should be low maintenance perennials because access may be restricted by other plants. Sketch a plan of the round flower bed, including any buildings and other gardens in the area. Divide the garden into quadrants for easier planning and design. Mark the various flowers with plenty of space in between for growth. Choose a reasonable size flower bed for the amount of time and work you are capable of when caring for the garden. Adjust the space for any border you may desire. Create a circle with a garden hose or twine in the desired location. Adjust the line as necessary until you are satisfied. Spray paint the line to mark it in a more permanent manner. Remove the sod from the top of the soil within the marked circle. Amend the tested soil according to the requirements of the chosen plants and flowers. Work the additives, such as peat moss, fertilizer and sand, into the soil as you till up the flower bed. Dig to a depth of 12 inches for a perennial flower bed. Plant from the center out towards the outer edge of the round flower bed. Space out the perennials as they will grow much larger as the years go by. Fill in empty spaces in between with blooming annuals. If you are able, scan a photo of the garden site into a photo editing program and add pictures of the actual flowers to the area to better visualize the round flower bed.